While I was in Europe, I traveled around a lot, of course. 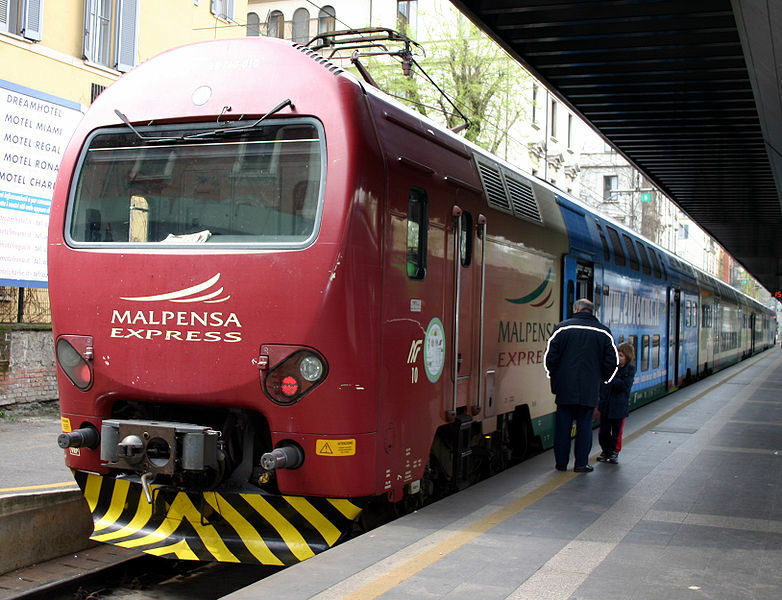 In Italy, I was regularly popping around the country on their excellent and inexpensive train system. One day we waited awhile for the train, and were the first, by a long shot, to get on the train. We sat in the first coach car, being between the first class car and the second coach car. As we were waiting, we became apprehensive as to why no one was boarding the train, but then noticed a growing crowd gathering outside the train. A rowdy, loud, obnoxious crowd. The kids started boarding, and sitting huddled around us. Our fears promptly heightened. Once a police officer boarded, he noticed we were there, and forced everyone into the second coach car - by violent force because the kids would not obey! Four police officers and two conductors battled off the crowd of kids who were trying to sit with us, shoved them into the second car, and locked the door between the cars. The conductors and police officers then proceeded to have a fight over the door, the conductors motioning that it is not strong enough, and the police officers ignoring them. Two police officers leave the train. The other two move into the first class car, leaving us vulnerable in the buffer zone between the crowd of violent kids and protection. Our fears peak and we decide to prepare ourselves for the absolute worse! We gather all our money, and divide it in multiple locations, our pockets holding 40EU each, because if they&apos;re going to mug us, they won&apos;t be satisfied unless they get some cash! The train has since been moving, so we sit back and prepare for a fight. A crowd rushes through the cabin straight to the first class cabin, while a handful stays to hit on me. I angrily bat back roaming hands and admonish them in Italian. Seconds later, the two police officers rush in and battle the crowd back into the second car. One leans on the door to keep it closed with all the banging, while the other retrieves a conductor so he can lock the door again. They have an animated discussion about the door, but come to no conclusion, and then return to the first class car. There really is nothing we can do, and so we just sit there. From my position, I can see the door quite clearly and there is a crowd of people drooling at us. Er. Me. The door slams open, yet no one comes through immediately this time. An attempting suave young man saunters into the cabin and greets me as gentlemanly as possible, and his slimy friends slyly slither in and sit across from us. I nod, with an obvious look of agitation on my face. He asks me where I am from in Italian, and I shake my head. He asks me where I am from in English, and I shake my head again. He then asks me if I even speak English, and I just simply shake my head. By now some have scrambled over to the first class car and got the attention of the police, who push them back into the second car. This time police officer has the key handy, and he just promptly locks it. Moments later they have broken through the door once again. Why bother locking it anymore? And what? The police officers couldn&apos;t sit next to the door with the rest of us? Er... just us, as we were the only people in the car. Everyone else must have had inside knowledge of this situation or something because they all had first class tickets! Inevitably they come back, but avoid for quite some time disturbing the precious first class car. Their chaos penetrates our cabin as the crazies pace back in forth exhibiting their maniacal natures. Several ask for money. A bunch sit across from us and stare at me. Eventually, Mr. Suave saunters back in and addresses me once more. I have made the decision to not speak to him in English. God forbid what will happen if he realizes that we can communicate! I was familiar enough with Italian to speak with him that way. He repeatedly asks questions. He tries to sit next to me, and I admonish him in Italian. Eventually he becomes absolutely fixated on what in the world my nationality is. After much pestering, I decided to tell him I was Czech! Once I did, a look of utter shock and defeat washed over his face. He looks at his friends and tells them I am Czech. He sits down and looks perplexed for awhile. I look at my companion, and say some randomness in Czech, like what would translate to, "A quarter handful thank you." We had lived in the Czech Republic for 3 months, so we were vaguely familiar with the language. It&apos;s a tough language, though, so of course none of these boys would have any idea what we were speaking to each other was actually random mixed and matched Czech phrases with a handful of Kat-ish. The boy stands up again with a new energy. He asks me a question. I ignore him. He asks me again, I say something to my companion in Czech-Kat-ish. The boy then gingerly, ever so carefully reaches out his hand, index finger pointed out and almost touches my hand. Almost. To anyone else observing the situation, you would swear that he touched my hand. But he did not! Ever so closely, but not quite. His hand actually quivered while hovering over my hand. I looked at this with mild amusement, but then went back to frustration. I knew if I communicated too much with this guy that he or his friends would pose a greater threat, so I looked up at him with utter contempt. He grabbed his hand back as if I had just bitten him. The fear he had was so hilarious, I almost laughed. I did not. I seemingly maintained my laughter, although the suppression almost drove me to tears. Of course at around the same time, the trouble making crowd invaded the precious space of the first class car, and the police officers beat the growing crowd back into the second car, and locked the useless lock. After all this, all I could do is just rest my head on my hand in astonishment. I remained in this state until the train stopped. Several other police officers boarded the train and escorted the kids off the train. As they passed by, one exclaimed, “I love you! I love you!!" while being dragged by a police officer. I had never been so happy to get back to my apartment before in my life.